Do you want to get Quick Facebook likes then, you have arrived to the right place. Through Facebook like to Download script, we can easily force our visitors to like our fan page. In order to get the downloading link for a specific file user would have to like your Fan page because they need that file, and the only way to get the downloading link is to like your fan page. This widget is amazingly overwhelming, when I first saw this widget it attract me like a bee to a honey. Let us start rolling our fingers on our tutorial. But before we get started, I know you would love to preview the widget so go ahead and give it a try. Note: If you have already like the page then First Unlike and then again like to test the widget. What is Facebook Like to Download? This widget is created to give you more command on your Facebook fan page by increasing your likes in seconds. This widget purely works on PHP and provides downloading links of a certain file, when someone likes your Fan page. Following are some of its glimpse features. Allows you to boost your Facebook Likes no matter whether it’s your Page or certain Facebook Post link. Easy to use, SEO optimized while no compromise on Speed. Build with PHP, supports each and every browser i.e. Google Chrome, Firefox, Internet explore, and etc. Easy to optimize, could be implemented on Blogger or any other HTML page in minutes. We will insert this widget in our posts, so users can easily download specific files by liking our page so to do so follow the following instructions. Now Select HTML Tab and paste the following code there. 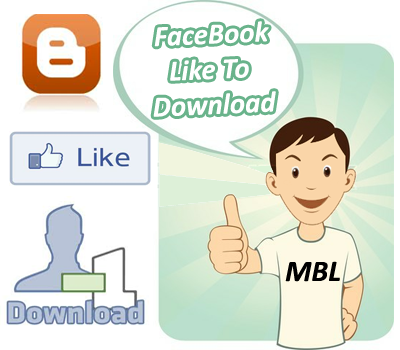 Replace http://www.Facebook.com/mybloggerlab with your Facebook Fan Page. Replace www.google.com with the downloading link you want to attach to this widget. Replace 520px if you want to adjust the widget of this widget. Replace 163 if you wish to change the height of your widget. Now after customizing your widget, publish the post and that's it. Using This Widget is Against Facebook rules or not? Answer: The answer to this question is pretty clear-cut, and that is a Big NO you don’t need to worry because it is a legal way of getting likes. Facebook is only against those websites which are playing key role in selling fake likes, but in our case a person likes our page because he needs to download the file, which will be only available for download when someone likes the Facebook page. We can use this Widget in WordPress? Answer: You can use this widget on any website, which accepts HTML it does not matter whether it is Blogger, WordPress or any other blogging platform. We can Use Multiple Facebook to Like Widgets in one Post? Answer: Yes without any hesitation feel free to apply as many widgets as you can, there is no restriction. We hope you have enjoyed the tutorial and just like our former published articles How to Block AdBlocker in Blogger and How To Block IP Address in Blogger. We hope you will give the same response to this one. This widget is identical to those who hosts lots of Freebie software on their blog. It would help them to increase their fans with an enormous command. If you need any help feel free to shoot your comments till then peace, blessings and happy Liking. thanx syed for this post. Thank for this wonderful post . I have waited for this for a long time. Hmm nice tut to incrase your likes ...! It's An Amazing Thing, Faizan I used it On My Site, And I Have A Question..
What To Do For Mutliple Links??? Thanks Every One For Appreciating the Widget :) Peace and Blessing For Making MBL one of the best Blogger Publisher Blog. What if the person has already liked our page? But then It shows widget for one and only like portion for other and doesn't automatically shows the download button for those who already liked it. Man i love you for this !!! hi faizan can you tell me how to make the script from one time pop up to all time pop up ?? This is really an unique and helpful one buddy. .Thanks. can you make it people just like the post and not the facebook page? Brother sorry but we cannot do that. Brother You can insert any Post URL to increase it's Likes. Hey Brother, The Issue is resolved and the widget works fine. Thanks for Reporting!! Please fix it, I really need it! It does not show download button after i click on like button, it seems to have a bug. Bro Can You Creat A Subscribe Download widget ? I'am wondering what will be happened if the visitor doesn't have any facebook account, or if they do not log in to their account. what will happen if the visitors do not have any facebook account?? Can they still download in my blog?? I want to know is there any free plugin, share to download or send to download instead of LIKE. Currently, we haven't developed such widgets.